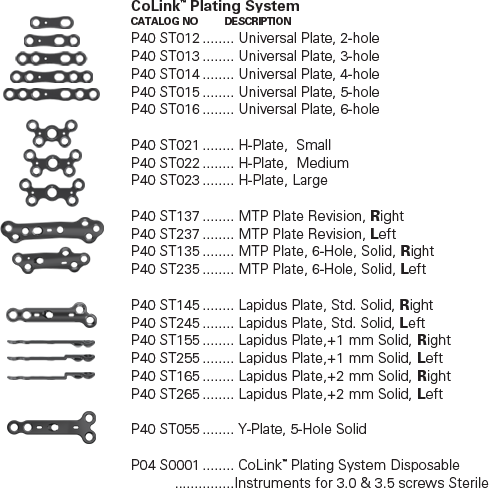 MTP and Lapidus Plates are indication specific, with corresponding Screws and Instrumentation are designed with Joint Line Placement reference. 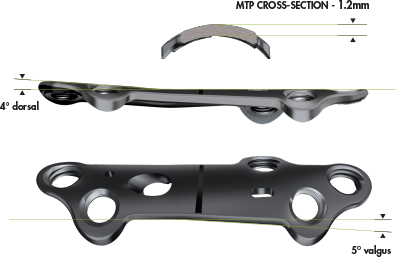 The MTP Plate is designed to compress and aid fusion of the 1st metatarsophalangeal joint and offered as 6 Hole, with Transverse Compression and Revision Plate with Standard Compression Slot option. 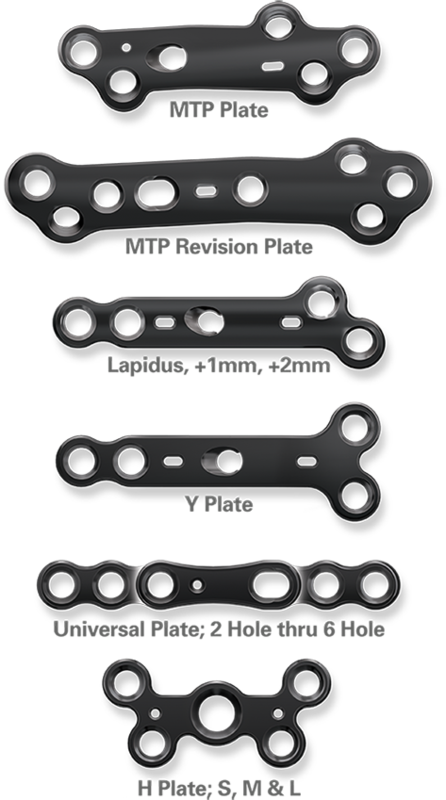 A Selection of 3 Lapidus Plates are designed for use in fusions of the first metatarsocuneiform joint, with Transverse Compression Screw, eliminating the need for an independent cross joint screw. Lapidus Plate are available in 0mm, 1mm and 2mm steps. 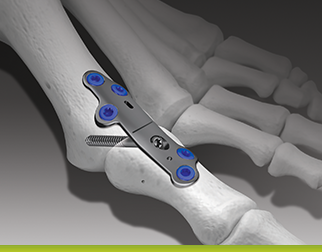 The Universal plate design allows patient specific, contours and can be combined with other plates to treat more complex fractures. A dorsal longitudinal incision is commonly used. 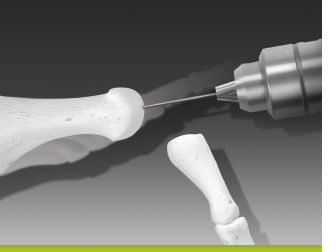 This approach provides excellent exposure of the MTP joint. A medial approach may be considered in patients where healing of the skin flap may be problematic. The amount of bone resection depends upon the desired length of the 1st metatarsal. (Note: some revision cases may not require additional extensive resection). Displace the phalanx plantarly to expose the metatarsal head. Using a powered drill, place a 1.6mm Guide Wire proximally through the center of the metatarsal head and into the diaphysis. Beginning with the largest diameter Reamer (21mm), place the Reamer over the Guide Wire and gently ream the metatarsal head until bleeding subchondral bone becomes visible on the joint surface. To ensure proper sizing, it is advisable to begin by using the largest size Reamer, and then downsizing to match the diameter of the metatarsal head. 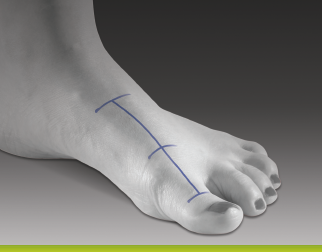 NOTE: Make sure to protect the sesamoids, and check the progress of the Reamer frequently to prevent excessive shortening of the metatarsal. Take note of the last Reamer size used. Once reaming is complete, the Guide Wire can be held to elevate the metatarsal head to enable the removal of the bone on the plantar aspect. 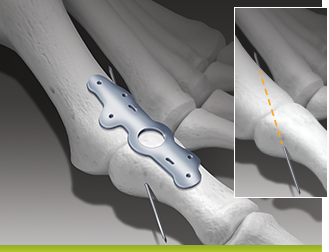 The proximal phalanx is plantar flexed using a curved McGlamry or Hohmann retractor. 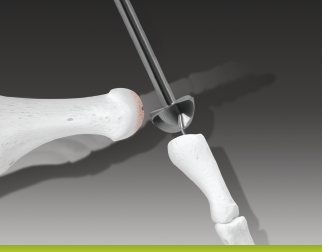 The 1.6mm Guide Wire is again placed in the center of the articular cartilage and directed through the diaphysis. Care should be taken not to penetrate the interphalangeal joint. Reaming should begin by using the smallest size of phalangeal Reamer (15mm) and must end with the same diameter size as the last Reamer on the metatarsal head. NOTE: The metatarsal head should be protected when reaming. Both the metatarsal and phalangeal reaming should end with the same size. Example, if the metatarsal reaming stopped at 18mm, the last and largest reamer used on the phalanx will be 18mm. 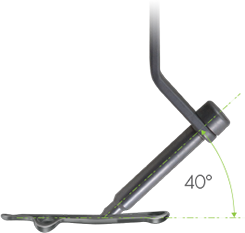 The cup and cone shaped surfaces can be aligned in any desired position. It is then possible to rotate the surfaces and set the dorsal flexion and valgus angles. Once this is determined a provisional Guide Wire should be placed across the joint through the plantar aspect, aligning the joint in the proper and final arthrodesis position. Once the correct Plate size has been determined, open the sterile tube to retrieve the Sterile Plate. If necessary bend the Plate to the required shape using the Plate Benders provided within the Instrument Set. NOTE: Plates should only be bent in one direction. Never re-bend Plates. The Plate should then be positioned over the joint using the Laser Mark to approximate the joint line. Temporarily fix in place with the 2, 1.2mm Olive Wires in the Pin Hole and Pin Slot. 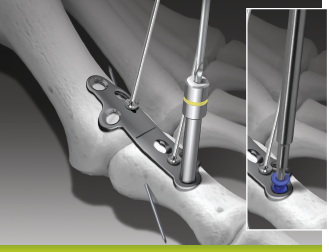 Postion the proximal Olive Pin in the most propoximal placement in the Pin Slot. Begin Screw placements with the most distal holes and follow the suggested sequence at right. 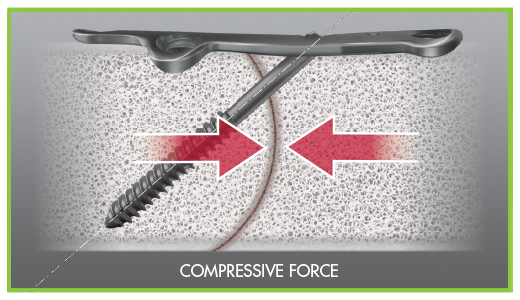 For CoLink™ XP Transverse Compression Plates the distal Screws should be placed first distally. NOTE: All Plate Screw holes can accommodate both locking and non-locking screws (3.0mm and 3.5mm diameter). The Transverse Hole can only accommodate a 3.0mmTransverse Lag Screw. 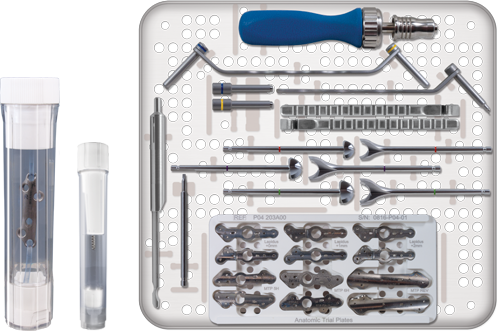 Once the Distal screws are in place, the Transverse Drill Guide can be used to prepare the Transverse screw hole. 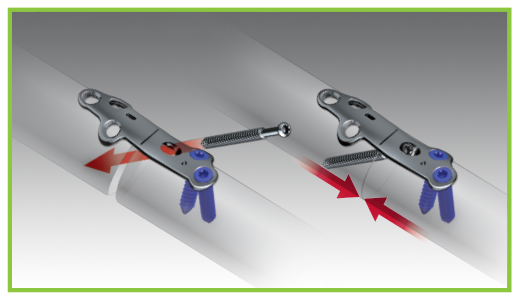 For optimum lag screw orientation, ensure the Drill Guide is seated completely in the Transverse hole. Correct placement is with handle vertical (90°) to plate withScrew trajectory at ~40° to plate. The plantar provisional Guide Wire should be removed and the appropriate 3.0mm lag screw placed in the Transverse hole. Use the Laser Markings on the provided Reamer with the provided Drill Guide for correct Transverse Screw length. OPTIONAL: The provided Depth Gauge can be used, however the depth reading must be adjusted -2mm to compensate for the space between Depth Gauge on Plate surface and actual bone surface. NOTE: Also, a Screw length subtraction of 1-2mm may be required if the joint is not completely reduced when the measurement is performed. The lag screw should be tightened in a clock-wise motion. 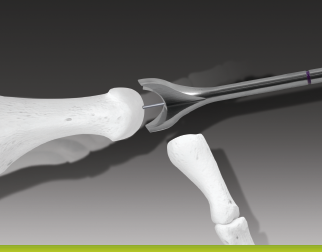 Once the joint is compressed, the remaining proximal screws are inserted and all temporary fixation wires are removed. 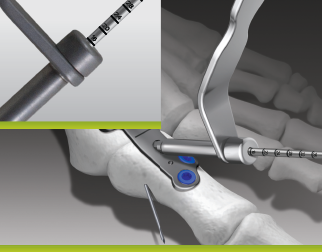 A non-locking plantar screw can be implanted to insure stable fixation. 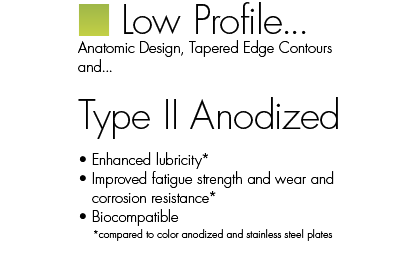 Surgical closure should be performed in a normal fashion.